"Architecture is more than an array of techniques designed to shelter us from the storm". Paul Virilio, Lost Dimension. On Friday, November 4th. 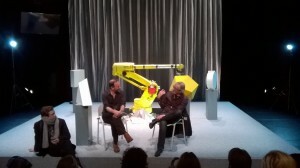 Performance Group Urland presented the third part of the IoT-trilogy in the Theatre Rotterdam. Afterwards we enjoyed a fine and most interesting discussion with the audience that proved to be very anxious and involved in theme and background. In particular some questions concerning the role of the arts within this topic raised a discussion which really should be continued since Urland’s performance is – alas – one of the very few devoted to other, more important ethical issues than the technology only. +++ actuele discussie over digitalisering binnen de architectuur bij UNSENSE Amsterdam; verdient regelmatige herhaling. +++ on Tuesday Feb. 19th.2019 a promising seminar on Virilio’s book ‘the Wall’ and the role of architectural publications today, presented by Wim Nijenhuis and Jan de Graaf. Location West, i.e. the former US-Embassy in The Hague. +++ most actual and relevant report by NESTA on the lack of civic participation in the 4th. revolution. +++ interesting article by UN-Studio’s Ben van Berkel on the future of smart homes, the use of data and the options for architects. +++ valuable and interesting observations and critique on trans-humanism by 6 researchers/scholars; what does it feel to be human, what does intelligence means referring to AI, etc. +++ boeiend programma Radio Operator; derde uitzendingen van Architecture City over ‘de Plooibare Woning’; m.n. door het interview met John Habraken. +++ finally a critical article about the ontology of a ‘smart home’; acknowledging that technology and rationalism only do not provide an adequate framework for living. +++ important new booklet in the ‘Situated Technologies’ series: Christian Nold in discussion with Rob van Kranenburg about the Internet of People. +++ illustrative and thoughtful article in ArtReview on OOO, i.e. object oriented ontology. Interesting given the current discussions on IoT/connected objects and the environment. +++ great discussion On Life in the Infosphere between Floridi, Sloterdijk, Weibel and Burda. +++ retrieved and reread; the article by Jon Bailey on his Archimorph site; dated 2011 but all the more actual as the innovations in both fields keep developing. +++ interesting article in Architecturemps (vol.6, nr. 3) an essay by Patrick Keiler, ‘the Dilapidated Dwelling’ in which he questions the lack of development in e.g. housing with reference to recent actual industrial manufacture.